Well this isn’t an easy film to watch through! Will Smith doing his best to be the ultimate martyr. Ben Thomas works as a taxman, yet while collecting from those suffering from debilitating or fatal illnesses he is compelled to help them. His utterly selfless acts are fueled by a tragic event in his past. As a rule I generally dislike “depressing” films; I don’t see why anyone would want to spend money, sit in a cinema, only to ball their eyes out and have a miserable time. There is a fine line though, to have this experience but to keep a tiny thread of hope persistent. Seven Pounds is a bleak affair, yet it includes some excellent twists-and-turns that stop it from being utterly soul destroying. Unfortunately, I would be spoiling it completely to go into how it does this. Will Smith, as always, does a faultless job here and in overview it is an excellent performance throughout. His character falls into depressive bouts of anger, hopeless loss, restored determination and hope whenever the story demands and you believe it. It is a well paced movie too; subplots evolve in parallel and keeps you hooked as the character tries to resolve everyone’s problems, and in doing so the ending comes rushing towards him. That brings me to my main issue, the ending. As always I won’t spoil it, but as I just eluded to, this ending comes rushing up and… like all of Smith’s films, it becomes a ridiculous pile of sentimental mush. I saw an ending coming, one quite gratifying yet sad, but Seven Pounds piles on the sentiment. I appreciated everything beforehand, even the sentimental elements, but the ending pushed it too far! If you don’t like Will Smith’s rather… sentimental and martyrdom acting roles I suggest you avoid this furiously, as Seven Pounds is the definitive work! 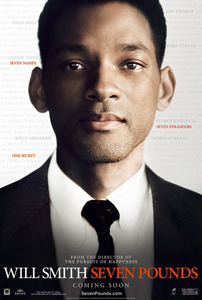 But, if you enjoy Clint Eastwood films (Million Dollar Baby etc) real heart-string pullers but with nice characters and the promise of hope, Seven Pounds could be for you.